Ocean Spray is treating guests to a healthy dose of cranberry at the 18th annual Epcot International Food & Wine Festival. From September 27th through November 11th, guests can stop by the Ocean Spray bog exhibit to learn how cranberries are grown and ways to incorporate them into a variety of tasty recipes. There will even be chef throughout the park cooking up a variety of dishes featuring Craisins® Dried Cranberries at demonstrations, private events, certain restaurants and at the Hops & Barley Marketplace. From savory dinners to simple side dishes and breakfast too, there will be a cornucopia of ideas for adding a healthy dash of cranberries into meals, morning, noon and night. In fact, adding a 1/4 cup of dried cranberries (the equivalent of a 1/2 cup of fresh fruit) to cereal, granola or oatmeal in the morning can help meet 25 percent of your daily fruit needs for the day. Looking for a lower-calorie snack alternative? Try Craisins® Dried Cranberries, the official fruit snack of Walt Disney World Resort and Disneyland Resort. Available in a variety of flavors, reduced sugar and 100 calorie portions, it’s a tasty, healthy way to add more fruit to your day. Farmers in the Ocean Spray cooperative take pride in delivering fresh-picked fruit to families around the world so they can enjoy the exceptional cranberry taste and healthy goodness. 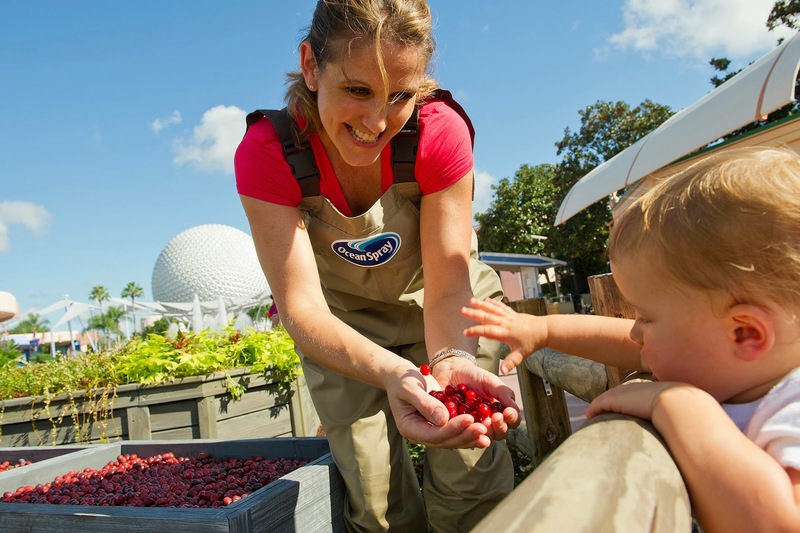 Delivering a true farm-to-fork experience, guests are invited to see how cranberries are grown and harvested at Ocean Spray’s cranberry bog exhibit at the Epcot International Food & Wine Festival. Filled with more than 1,000 lbs. 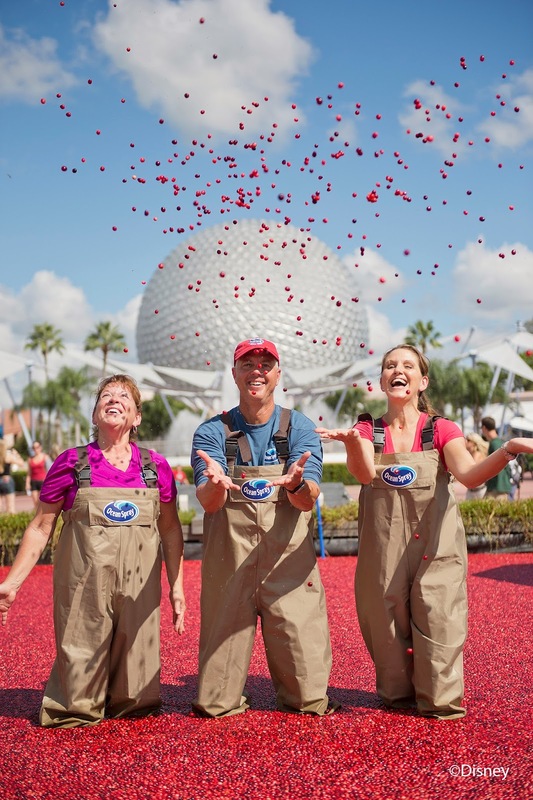 of fresh, floating cranberries, the bog presents an opportunity for guests to bask in the beauty of a harvest while learning about the taste, health and heritage of the fruit from Ocean Spray farmers and Disney Cast Members. Can’t make it to the Epcot International Food & Wine Festival? Don’t worry, visit www.oceanspray.com for delicious everyday ideas and seasonal inspirations from around the world. Cranberry lovers eager to share their stories and recipes are encouraged to tweet @OceanSprayInc or post on Ocean Spray’s Pinterest, Facebook or Instagram pages. Families everywhere are enjoying the great taste and healthy goodness of Craisins® Dried Cranberries. Fat-free, cholesterol-free, and with no artificial flavors, preservatives or trans-fat, cranberries can be part of a balanced diet and healthy lifestyle. Craisins® Dried Cranberries are a good source of fiber and help curb hunger longer than many snacks. The health benefits of cranberries are well documented and Ocean Spray is committed to providing excellent, healthful products. Whether you are looking to add more fruit to your diet, increase healthful snacking or reduce calories, the cranberry is exceptional and full of whole-body benefits. From Diet, to 100% Juice, to Craisins® Dried Cranberries, Ocean Spray has a wide variety of product choices for every taste and preference. For more cranberry health information, visit www.cranberryhealth.com.